Interesting restaurant- and hospitality-related research never stops coming our way. For MRM’s mid-May edition, we have research on dining habits, food traceability expectations and Q2 cautious optimism. 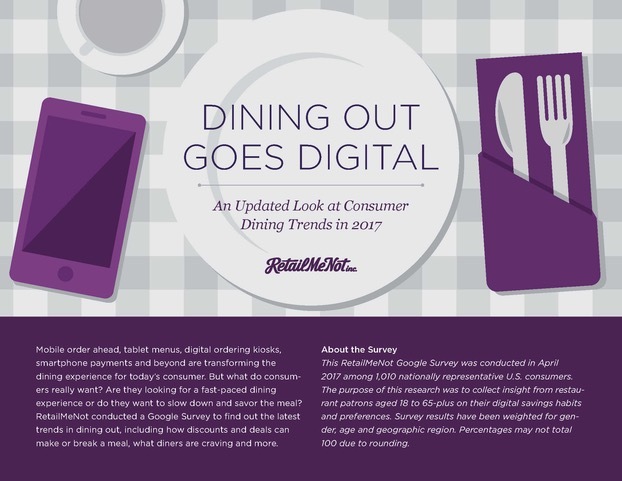 RetailMeNot, Inc. released the results of a survey titled “Dining Out Goes Digital” to showcase updated consumer habits as it relates to eating outside the home in 2017. In 2016, sales at restaurants and bars outpaced sales at grocery stores for the first time ever, according to the U.S. Census Bureau. Additionally, a survey from RetailMeNot released last year showed consumers are turning to their mobile devices to decide where to eat and how much to spend. Today, consumers are looking to save money on food. 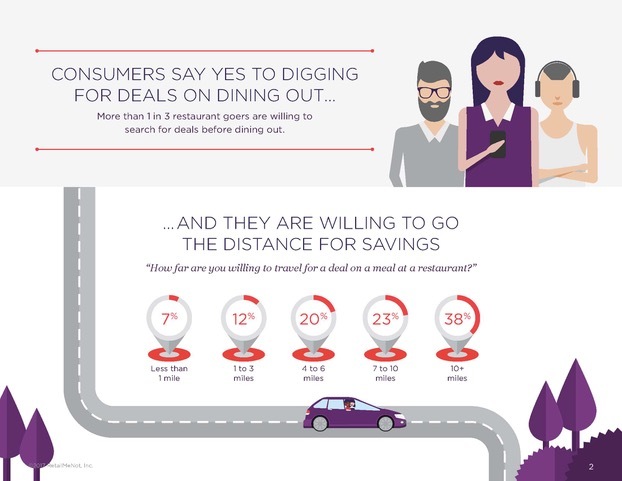 In fact, RetailMeNot’s latest food and dining survey data shows more than one in three restaurant goers have searched, or plan to search, for deals ahead of dining out. 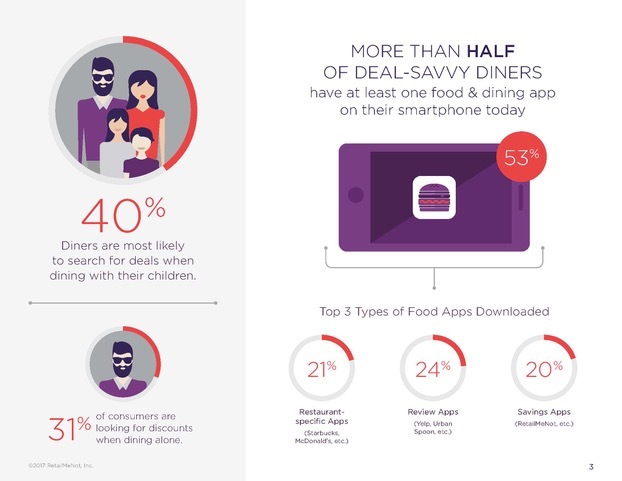 Further, more than half (53 percent) of consumers surveyed have at least one food and dining app on their phone, with about 20 percent of those apps focused primarily on saving money. Consumers are more likely to explore a new restaurant or cuisine if offered a deal or a discount: 80 percent of consumers indicated they’re likely to try a new restaurant if they’re offered a promotion. How Far Are Consumers Willing to Go? Consumers go the distance to get a deal on restaurants, with 62 percent indicating they are willing to travel up to 10 miles to eat at a restaurant offering a deal or discount. On the other hand, today’s digital world also helps food come to them, rather than having to go out. The survey revealed that 61 percent of men have food delivery apps on their phone, compared to only 39 percent of women. A majority of consumers (72 percent) would prefer dining in at a restaurant versus using delivery and take-out options, and they’re hungry for discounts on a variety of foods. American food captured the biggest share of desired discounts (42 percent), with pizza, Italian food and Mexican food all tied at 39 percent. More specifically, millennial diners have a greater craving for savings on burgers (44 percent), while Gen Xers are on the hunt for a good deal on Mexican food (38 percent). Download the results of the full 2017 survey at www.retailmenot.com/digitaldiners2017. FoodLogiQ polled more than 2,000 U.S. consumers to gauge their sentiment around food traceability and expectations for food companies regarding recalls and foodborne illness. Additionally, the survey posed questions around consumer preference for the identification of food sources with regard to labeling and menus. The complete survey and its findings have been published in A Food Company’s Guide to What Consumers Care About in the Age of Transparency, now available as a free download. More than 50 percent of respondents expect food companies to fully address a recall or foodborne illness within 1-2 days. If a brand/restaurant that consumers like experiences a recall leading to consumer sickness, nearly 25 percent of respondents admitted they would never use the brand or visit the restaurant again. Thirty-five percent of respondents will avoid this company for a few months and only maybe return after the issue has been fully resolved. With regard to transparency in labeling, 54 percent of respondents want as much information as possible on the label, and nearly 40 percent want country of origin, allergen alerts and GMOs all identified on the label. Breaking data from the FoodLogiQ study even further – For respondents who self-identified as “caring deeply about the quality of food that I eat,” a higher percentage (44 percent) claimed that if a brand or restaurant that they liked experienced a recall or contamination leading to consumer sickness – they would avoid the brand/restaurant for a few months and only maybe return once the problem is resolved, while nearly 20 percent said that they would never use the brand/or visit the restaurant again. Additionally, respondents who care about food quality also placed a great deal of value in the rate of response to recalls, with 55 percent citing 1-2 days as the acceptable amount of time in which a food company should be fully addressing a recall or foodborne illness. Interestingly, participants who identified on the other side of the spectrum as “generally eating just about anything” placed similar value in the importance of speed with regard to recalls, with 45 percent still expecting the response rate to be one to two days. A new survey by the Foodservice Packaging Institute revealed strong industry growth and sales in 2016 and expected volume growth and profit expansion in 2017. “This year’s State of the Industry Survey forecasts a promising outlook for the foodservice packaging industry and our members,” said Lynn Dyer, president of the Foodservice Packaging Institute. Compiled from FPI’s annual State of the Industry Survey, results included input from raw material and machinery suppliers, converters, and foodservice distributors and operators. Nearly 60 supply chain partners shared business growth successes and challenges from 2016. FPI also collected the expected changes to sales volume and profits, expansion and purchasing plans, opportunities and challenges this year. Nearly 75 percent of foodservice packaging manufacturers and suppliers reported volume growth and nearly half reported profit growth last year. Positive indicators for industry growth in 2017 include: 60 percent of the North American manufacturers reported corporate expansion plans through construction of new facilities, expansion of current facilities, and mergers and acquisitions; and more than 80 percent of North American converters plan to purchase machinery in 2017 — up 30 percent over last year. Survey respondents anticipate that the greatest area for market expansion is in the fast-casual sector due to its continued popularity and ability to adapt to an evolving consumer. New this year, respondents predict other major expansion opportunities in convenience and grocery stores as these markets try to capture consumers’ food dollars. Catering and delivery services were also referenced as operators seek to expand sales opportunities beyond their physical establishments. “Growth in markets such as fast-casual restaurants and catering provide new opportunities in packaging that our industry is embracing,” said Dyer. Recovery / end-of-life options for foodservice packaging. An executive summary of the report is available to all at http://www.fpi.org/resources. Restaurants experienced a third consecutive month of negative same-store sales in April, with results essentially unchanged vs. March. Sales declined by -1.0 percent for the month, which is only a 0.1 percentage point improvement from March. This insight comes from data by TDn2K™ through The Restaurant Industry Snapshot™, based on weekly sales from over 27,000+ restaurant units and 155+ brands, representing $67 billion dollars in annual revenue. Same-store traffic declined -3.3 percent during April, also a very modest improvement of 0.1 percentage points over March’s results. Through April, 2017 sales are down -1.5 percent vs. a -2.3 percent sales decline in the fourth quarter of last year. If sales remain at April levels for the balance of the second quarter, it would be the best quarterly performance in over a year. The best performing segments in April, and the only ones with sales increases, were fine dining, upscale casual, and family dining. As has been the case for over a year, upscale casual and fine dining are at the top of the average guest check scale and are aligned with a more experience-based dining proposition for a less price sensitive consumer than mid-scale industry segments. It is important to note that sales for all three of these segments appear to have been positively affected by the shift in the Easter holiday. The weakest segments in April were fast casual and quick service. After years of positive growth and being one of the top performing industry segments, quick service has experienced a downturn in 2017. Additionally, the Black Box Intelligence Market Share Report shows that fast casual is the fastest growing segment, which indicates a possible cannibalization effect occurring in the segment. Struggles continue for casual dining, although the rate of decline has lessened somewhat. Average same-store traffic growth for 2017 was -2.9 percent vs. the -4.1 percent drop in the last six months of 2016. Staffing woes continue for the industry as hourly employee and restaurant management turnover rates continued to rise, according to the latest data from TDn2K’s People Report™. While it may seem impossible for things to get any worse, restaurant operators continue to predict increasing recruiting difficulties for upcoming quarters based on the People Report Workforce Index. Almost four out of every five restaurant terminations in 2016 were employees leaving their jobs voluntarily, and about 40 percent of all hourly employee terminations are within 90 days of hire. This obviously speaks to the tight labor market and increased competition for employees. It is particularly challenging to fill back-of-the-house vacancies. Companies responding to a recent People Report survey said they typically receive three times more candidates for front-of-house positions than for back-of-house. Back-of-house positions also take about 40 percent longer to fill. Changes in the immigration landscape will undoubtedly add uncertainty to an already-volatile labor market. Marketing Vitals, the award-winning restaurant intelligence solution and TDn2K’s Black Box Intelligence™, the restaurant industry’s leading financial capital analytics firm, have announced a collaborative partnership to increase the understanding, value and influence of big data, as it pertains to the service industry. “We are proud to partner with TDn2K™ on the Black Box Intelligence integration that will further educate and enhance restaurants and the customer experience,” said Rom Krupp, CEO of Marketing Vitals. Through this partnership, marketers and restaurant companies will gain a better understanding of their units’ performance through a more enriched and robust data set. Black Box Intelligence™ users will gain enhanced automation and new KPIs, and Marketing Vitals’ customers will have the ability to benchmark their sales and traffic performance against their competitive sets across the industry. The two brands’ expanded data collection and analysis capabilities will enhance the data offering of each company and provide more value for TDn2K members and Marketing Vitals’ customers. “When Marketing Vitals was introduced to us, the comment was made that ‘if Marketing Vitals and TDn2K, as best in class solutions could integrate data, it would be a marketer’s dream!’ We are excited to bring this integration to the best in class companies as a new competitive advantage,” said Wallace Doolin, Chairman and Founder of TDn2K. The partnership of Marketing Vitals and Black Box Intelligence will illuminate big data’s influence on ROI for the restaurant and service industry. Through the collaboration and the expanded network it produces, big data and its insights will be brought into full view for the members and customers of both organizations. A new report by Catapult Marketing finds the experience-driven marketplace includes consumer selection of where to dine out. By using proprietary research methods to uncover the drivers of brand preference in the quick-service (QSR) and fast-casual restaurant industry, Catapult’s “Unmasking The Drivers of Brand Preference in QSR” sheds light on a variety of experiential factors that are likely to determine the winners in the category. “The back and forth about ‘where to eat?’ isn’t a rational or functional conversation. There are deeper emotional layers that drive brand selection,” says Doug Molnar, VP, senior director of planning at Catapult. A two-part research study isolated the stated intent of restaurant selection from the true drivers of brand choice. In phase one, a Catapult ShopperLab™ survey of over 1,000 U.S. consumers, revealed a pattern of selection driven largely by practical factors such as type of food, choice of cuisine, location and affordability. In phase two, a SolutionScan™ survey of over 2,000 diners, many of those factors fell to the wayside, replaced by a variety of influences related to the type of experience that diners were seeking. 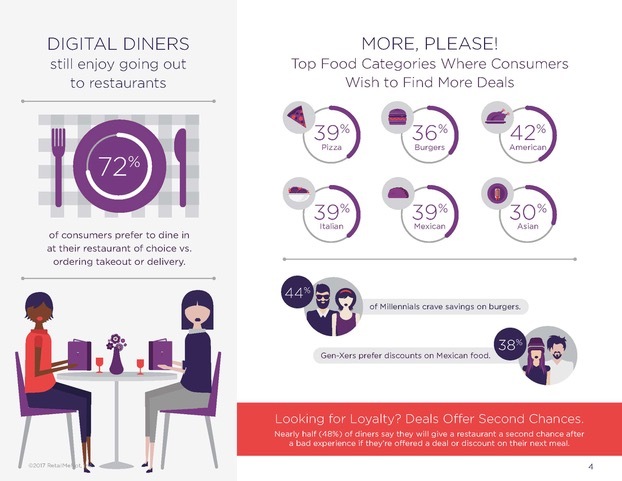 The research revealed that diners in the Millennial and younger age groups are a complex target for restaurant marketers. On the one hand, these are particularly cost-conscious consumers, placing affordability at the top of the list of stated purchase intent. However, the SolutionScan survey revealed deeper experiential forces (e.g., seeking a trendy place to eat) driving the restaurant choices of Millennials. “Millennials came of age in an experienced-based culture, so their expectations with regard to customer experiences are much higher than those of other groups, and that is part of what’s driving them to constantly try new things,” observes Brian Cohen, EVP, senior group director and head of digital integration at Catapult. Cohen contends that QSR chains need to think about ways to dial up the “experience and experiment” factor in order to win over today’s younger consumers. That can be achieved through menu innovation or by making the order-ahead process more fun and expedient through an exciting new mobile program. QSR and Fast Casual chains can also look to the broader food industry for ideas — such as promoting healthier menu items — that will appeal to Millennial customers. Offer quality food at a fair value. Move beyond functionality and connect to the unique emotions of the dining experience: It’s not just about the food. Introduce value-added content that enhances the overall customer experience. Spread innovation from product development to menu design to staff training up and down the organization. Add subliminal cues to nudge customers inside the restaurant: Atmosphere counts. Technomic reporting indicates that the restaurant industry overall fared relatively well in 2016, but full service has experienced some highs and lows, with annual sales growth dipping to 1.4 percent and unit growth remaining flat. Traditional casual-dining chains most heavily contributed to this segment’s troubles. The top five largest full-service brands, four of which are casual dining, all either had negative or slow sales in 2016. Report is available for purchase here. Bright spots within full service are polished/upscale and contemporary casual-dining chains, which increased sales by 4 percent and 4.5 percent, respectively. Even fine dining saw sales growth rise by 4.9 percent due to the affluence of the sector’s customer base, quality of offerings found at these brands and appeal this segment has with today’s consumer. Asian: The 4.3 percent sales jump of this category represents consumer interest in more specialty-focused brands, as well as the continued appeal of ethnic cuisines. Sports Bar: The 3.9 percent sales increase for this menu category demonstrates that opportunity still exists for brands to appeal to consumers with a varied craft beer selection, craveable pub fare like burgers and wings, and an overall sports-focused atmosphere. Technomic’s 2017 Top 500 Chain Restaurant Report provides an exclusive one-year sales forecast by menu category, an expanded outlook and opportunities section, as well as key themes to help navigate the current industry landscape. The Food Corridor, LLC, a Colorado-based software company that connects food entrepreneurs with commercial kitchen space, has released an in-depth report on the state of national shared-use kitchen policy. Based on surveys and interviews with more than 30 incubator and commissary kitchen operators from across the United States, the policy report concludes that inconsistencies in municipal, county, and state food codes may be limiting growth in local food systems. The report includes insights about kitchen clientele, best practices for onboarding clients, health department procedures and relationships, insurance considerations and the future of incubator kitchen policy. The report can be found at here. For start-up and growing food businesses (i.e., food trucks, caterers, artisan food manufacturers, etc. ), accessing commercial kitchen space is a challenge. By law, food businesses are required to use licensed kitchen facilities, something not always available and affordable to them. Established in 2016, The Food Corridor’s mission is to enable efficiency, growth, and innovation in local food systems via a software-as-a-service management platform to assist operators of shared-use kitchens. The difficulties that food businesses experienced in navigating local regulations, and inadequate licensing options, prompted the study to help shared-use kitchens identify best practices and policies to support the emerging industry. With summer approaching and fitness on the minds of people across the nation, Grubhub, the nation’s leading takeout marketplace, today announced the results of a study of the most popular healthy eating plans in the United States. Results from this study showed significant differences in healthy eating preferences between genders, as well as cities. Grubhub analyzed orders related to the most popular healthy eating plans in the United States: paleo, raw, juice cleanse, vegan, gluten-free, low-fat, Mediterranean and keto diets. Using a combination of dietary tags and a deep-dive into foods that align with specific eating plans, Grubhub analyzed order data from Jan. 1 to Dec. 31, 2016. In doing so, Grubhub data analysts ranked the most popular eating plans across the nation, as well as the preferred plans by city and gender. Meat and poultry products are consumer favorites, food industry mainstays, and protein powerhouses—all factors that will keep the U.S. industry for animal protein growing despite challenges from plant protein alternatives, according to market research firm Packaged Facts. In the brand new report Meat & Poultry: U.S. Retail Market Trends & Opportunities, Packaged Facts forecasts that total retail sales of meat, poultry, and meat substitutes will be just shy of $100 billion in 2021. Due to its higher price point, meat will dominate dollar sales despite still trailing poultry in per-capita consumption volume. Meat substitutes will account for less than $2 billion of the projected total. Yet despite meat’s popularity and projected growth, this is not an industry without its fair share of scrutiny, comments David Sprinkle, research director for Packaged Facts. “Meat continues to evolve and be re-evaluated by consumers in the wake of years of consciousness-raising on several topics, including humane animal treatment, meat processing, and nutrition,” says Sprinkle. Thus in the years ahead, Packaged Facts predicts consumers will be mindful of their meat consumption, whether for economic, caloric, dietary, or ecological reasons. For those who seek out sustainable meat and poultry, specialty products like grass-fed or local beef, heritage poultry and even wild boar will be on point. Consumers will look to meat professionals to connect them with these products, explain the product benefits, and educate on how these products are best prepared and served. Consumers minding their pocketbook will take cues from how cultures around the world make less-expensive cuts like brisket taste great. Likewise, retail sales of meat will also receive a boost from growth in consumption of pork, which is expected to maintain its low cost advantage over beef. In addition, many previously overlooked cuts of pork (such as pork shoulder) are experiencing a resurgence in popularity both at retail and in restaurants. Meanwhile, retail sales of poultry are expected to increase over the ensuing five years, supported by poultry’s cost advantages relative to many types of meat. A further advantage for chicken: health authorities such as the American Heart Association continue to encourage consumption of poultry and seafood as alternatives to red meat. With convenience and portability a trend across the food and beverage industry, consumers seeking high-protein meat snacks will find a plethora of meat jerky, meat snack bars, and meat sticks available, as well as crunchy cracklings from high-quality pork, plus plant- and nut-based meat substitutes. This report examines the current and forecasted U.S. retail market for meat and poultry products, including fresh, frozen, and processed products, as well as meat substitutes. The discussion includes key trends driving consumer purchases within this food category, including demand for locally sourced, natural, and/or organic products. Value-added products that reduce preparation steps are also appealing to busy consumers. Other major influences on the market, such as concerns over the treatment of animals, are also discussed. Long-term trends and year-to-year volatility in product prices – influenced by factors such as weather conditions and outbreaks of animal disease – significantly impact consumption patterns. Consumer attitudes regarding meat, poultry, and meat substitutes are also investigated. 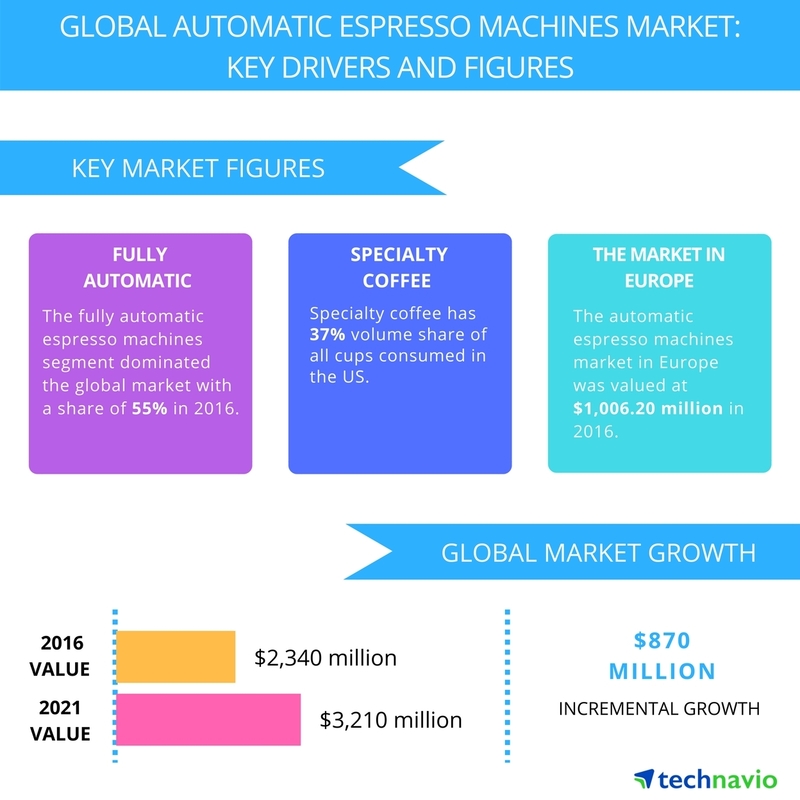 Technavio analysts forecast the global automatic espresso machines market to grow at a CAGR of almost 7 percent during the forecast period, according to their latest report. The research study covers the present scenario and growth prospects of the global automatic espresso machines market for 2017-2021. The market is segmented by product (fully automatic espresso machines and semi-automatic espresso machines), by distribution channels (supermarkets, hypermarkets, mass merchandisers, and department stores, specialty stores, and online retail), and by geography (Europe, North America, APAC, and ROW). The global automatic espresso machines market is expected to reach to USD 3,210 million in 2021. The demand for coffee remains unaffected by price changes in most regions. The International Coffee Organization states that despite the volatility in the prices of coffee beans, the consumption of coffee is expected to grow by 2021. Countries like China and India largely drive this rise in the consumption of coffee. Manufacturers of automatic espresso machines are developing new products. They are coming up with product innovations to attract a wide customer base. This enables them to attain a competitive edge in the market. They also add user interface panels that increase convenience and add to the aesthetics of the machines and focus on enabling more customization. The latest product innovations ensure that these machines produce coffee that is on par with that produced using professional espresso machines, in terms of taste and quality. Many vendors offer innovative and customizable features in their espresso machines, such as scheduling, updates, adjustable brew timings, cool-to-touch, and spill proof features. The features also give notifications when the machine needs more water or when it is running low on coffee beans. There are other value-added features, such as the self-clean function, that are integrated into many automatic espresso machines. Smart apps can also learn individual user routines and suggest the number of times they might want a cup of coffee. “One of the major players in the market, Nestlé Nespresso, offers Nespresso Prodigio, which is equipped with Bluetooth connectivity. Users can control their Nespresso Prodigio remotely and can schedule their coffee at specific times,” says Poonam. The demand for espresso machines is also increasing among residential customers. Coffee aficionados are interested in different varieties of coffee. The vendors in the market are launching various espresso machines that provide varieties of coffee. For instance, Philips had launched the Saeco Avanti app to cater to the demand of such customers. This app enables users to acquire knowledge about more coffee varieties and share their recipes via social media. The company has launched the Saeco Brand Ambassador Program to fortify brand engagement and retain customers. This facilitates users to enroll in coffee connoisseur classes and receive tips for maintaining their espresso machines. 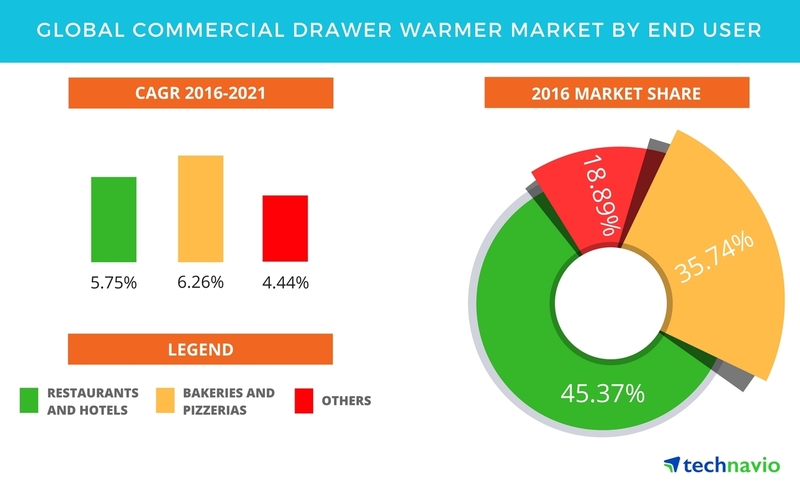 Global commercial drawer warmer market is expected to grow at a CAGR of close to six percent during the period 2017-2021. This research report titled ‘Global Commercial Drawer Warmer Market 2017-2021’ provides an in-depth analysis of the market in terms of revenue and emerging market trends. This report also includes an up to date analysis and forecasts for various market segments and all geographical regions. This segment includes quick service restaurants (QSRs), full-service restaurants (FSRs), fast casual restaurants (FCRs), and hotels. Many premium hotels and FSRs prepare food and store it in blast chillers to keep the pre-cooked food fresh. Once the order is placed, the pre-cooked food is warmed in drawer warmers at specific temperatures by using thermostat temperature control. Various food items such as baked potato, vegetables, and bread can be heated quickly and served hot. Many restaurants and hotels procure high-end drawer warmers that are aesthetically designed and go with the kitchen decor. In addition, restaurants and hotels that have space constraints prefer to use built-in drawer warmers as it can significantly save the countertop space for other kitchen equipment. The bakeries segment is one of the significant users of the commercial drawer warmer, as the bakeries use the equipment to serve various bread preparations, croissants, pretzels, buns, and rolls. Most of the bakeries prepare their baked items in advance, and during the peak selling hours, these bakeries tend to use the drawer warmers to heat and serve the food warm. Similarly, some of the pizzerias use the drawer warmer to warm different kinds of pizzas. Pizza chain brands that provide pizza delivery systems use drawer warmers to deliver warm pizzas at the doorstep. For instance, in 2015, Domino’s Pizza unveiled its delivery car service named DXP in the US, which delivers pizzas at the customer’s doorstep. Pizzerias also offer appetizers and side dishes such as nachos, mozzarella sticks, tortillas, and dough bites. These appetizers are usually pre-cooked, and the operators use drawer warmers to heat the pre-cooked side dishes and serve them fresh. “Manufacturers also provide moisture-control mechanisms in drawer warmers, so that dry appetizers like nachos remain crispy and crunchy while serving,” said Manu. The others segment includes catering companies, cafes, clubs, and pubs. Catering companies provide food items at various events, weddings, and celebrations and require significant use of food warming equipment such as drawer warmers. Vendors of drawer warmers are improving product design to allow end-users to store the food in the warmer in the same pot or dish in which it was cooked. This can save time for the operators by reducing the need to transfer the food from one pan to another. The casters under the drawer warmer provide mobility to the equipment.